The upswing of “super-foods” has been shown in virtually every diet and nutrition article as of late. You may remember chia as those funny figurines with grass-like hair; however, chia seeds have now become a trendy addition to a nutritious, every day diet routine. 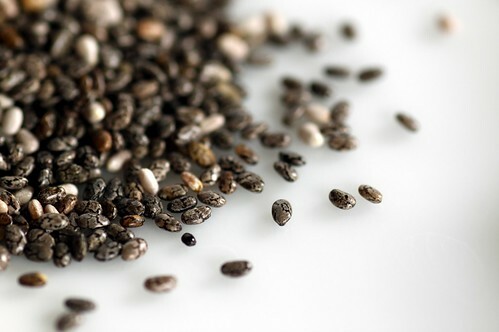 In fact, though the trend is modern day, chia seeds have been around since the Mayan and Aztec days when they were used for both dietary and monetary trade benefit. Additionally, chia seeds provide a hefty addition of omega-3 fatty acids, fiber, protein, antioxidants and calcium. Just 10 grams of dry chia seeds, which is the equivalent of approximately 1 tablespoon, delivers 2 grams of protein, 9% of your daily calcium, 4.5 grams of omega-3 fat, 6 grams of carbohydrates, and 5.5 grams of fiber. There are endless ways to incorporate chia seeds into your diet. In fact, you can even add them in 3 different forms. Chia seeds can be simply sprinkled dry on many dishes, as they have a somewhat neutral, slight nutty flavor. The seeds can also be soaked in water to create a chia gel, not unlike tapioca, or a chia seed oil can be extracted as well. Nevertheless, it is important to note that while chia seed oil is still beneficial, you will miss out on the protein and fiber benefits of the dry or gelled form of the seeds. Dry chia seeds can be sprinkled on salads, stir fry, mixed into dressings, baked with breads and muffins, added on top of yogurt and cottage cheese, or virtually any other dish. By mixing chia seeds in water, they take on a tapioca-like consistency that can be a great compliment to any juice, smoothie, sauce and soup. To mask the slight texture even further, you can grind chia seeds in the blender or coffee grinder and add to any type of food. While nothing completely replaces a proper diet and adequate exercise, chia seeds pack a pretty powerful punch in a small package. So walk away from growing those grass-haired chia pets and start putting those seeds to better use in your daily diet routine! What other tasty ways do you like to eat chia seeds? Where can i get these seeds ? Hi Jim, chia seeds can be found at many local grocery stores and bigger chains like Meijer, Kroger and Whole Foods. They are normally in the organic food aisle. I hope this helps!